White Claw has provided some updated visuals -- we've been working on adjusting the structures so that they don't blend in quite as well with the terrain. The change is visible on the Storage Tanks structure. Basically, updated lighting and shadows have been added with some tweaks to materials. Gives the structures a very distinct look. Also, new structure not seen in the original game -- the Solar Panel Array! 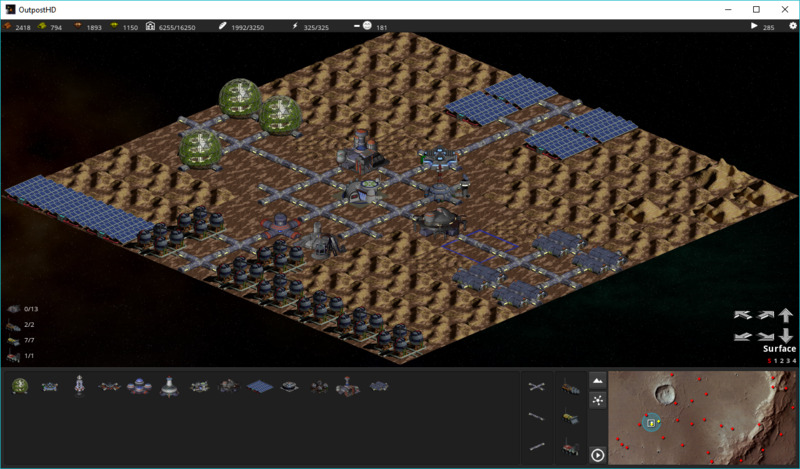 This is a cheap power generation structure available from the very beginning of the game that produces a small amount of power (at the moment 25 units of power). It requires one person to operate each turn (basically, they're the ones out there scrubbing the panels to keep them clean or whatever). The basic idea is that when you first land you won't have solar receiver arrays available until you complete the necessary research to launch solar satellites and the fusion reactors are very expensive to build and operate -- these are quick and cheap and keeps the rabble employed until you hit the mid-game where your resource production has stabilized, your population has begun to increase and you can afford to operate a fusion reactor while you develop new technologies. Anyway, that's the basic idea. I want to play with the power requirements of various structures so that while these are cheap you'll still need to be careful with how many you build so that 1) you don't over extend your population and 2) you don't overextend your power grid. I like the designs of the digger, dozer, and miner!. As far as the Solar Panel Array, I love it. When you're first getting started, there isn't much in resources and lots of people needing something to do. It's also a quick source of power to get set up before the SEED facilities start failing. Great idea! I also like that the selection icons are starting to match up with what gets put down on the work area. The shading makes a big difference! May I ask how the designs for the underground facilities are shaping up? Welp, the underground structures haven't progressed too much. White Claw's been busy with work and family and since it's all volunteer work I won't be cracking any whips. Glad you're appreciating the work going into this. It's definitely starting to shape up. I've also started putting together the research tree (not in-game, this is basically just a tree map) and what different path will yield (including unlocking buildings). For example, the solar receiver array won't become available until after the Solar Power Satellite research is done and to get that done requires a great amount of research in physics and astronomy. It's also not just enough to research the satellite -- you also have to research the launch vehicle and rocket propulsion to get the satellite into orbit. Basically, the receiver array is going to be a later stage deal. And that's just an example -- I want to have a number of structures unavailable in the beginning with research making them available and ultimately improving upon their benefits and/or drawbacks. But all in good time. I like the designs of the digger, dozer, and miner! Thanks! And I agree on the shadows. I think they help quite a bit, though they're a bit of a challenge to set up in a way that makes sense (so they don't bleed off onto other tiles and such). May I ask how the designs for the underground facilities are shaping up? I haven't started reworking them yet, though I did a couple of them. Ultimately I decided to try and focus on the surface structures to get them done, though that's obviously taking some time. Yeah...Unfortunately work got pretty busy again last week (unexpectedly) and it bled over into this week. Partly because of that, I also had to work on a different side project this weekend. Also some family stuffs, though it's all on the good side at the moment. So yes, still plugging away! Hey, I know how life happens. I'm trying to get a privacy fence put in during the evenings after work. Not a lot of fun when temps are in the mid- to upper-90's at 6pm. And that's when I'm not staying late at work trying to get someone's jet back to them. Plus trying to find time with the wife, etc. You guys know how that is. This is a side-project for you. I'm just thrilled to see how far you've come with it since I joined OPU. Ah, so JetMech really is a Jet Mech? Nice. I have no such parallel with my forum name and vocation. Yeah, and mine is just plain misleading. I'm actually a Ferengi. Now excuse me while I go acquire some profit. My forum name is the same name I use everywhere (or leeornet where underscore's aren't allowed anymore) -- was the first handle I chose when we first got Internet way back in 1994 (leeor_net @ nic.com) -- kinda stuck since then.